Move over apples, pears and bananas! 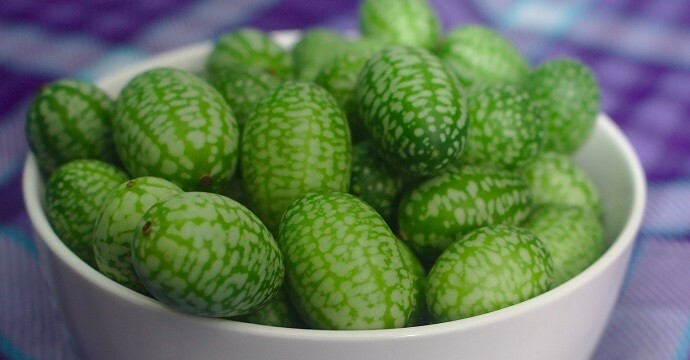 Here is a list of 20 exotic fruits you may have never seen, or even heard of. They all have their own unique, weird and unusual shapes, flavors, colors and nutritional benefits. So next time you go on holiday in some tropical paradise, keep an eye out for one of these exotic and delicious fruits and indulge yourself. The cherimoya may not look overly appealing at first glance, but when you cut this green fruit in half and eat its delicious flesh, you will definitely want more of it. Cherimoyas are native to South America, and over the years have also been introduced to other warm climates such as in South Europe, South Asia and Africa. 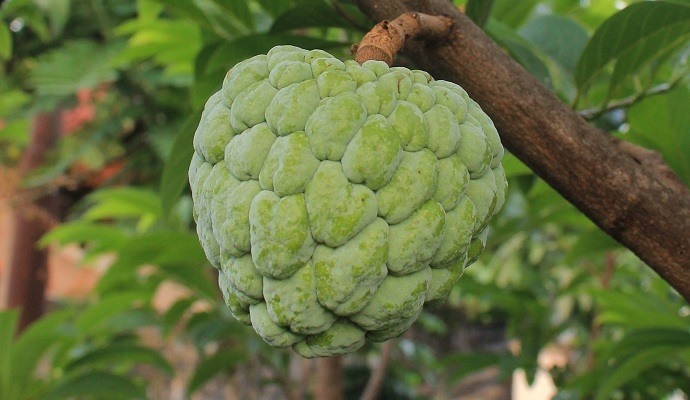 The flesh of the cherimoya is of a creamy, custard-like texture which is why this fruit is also referred to as the custard apple. The cherimoya fruit is very refreshing and tastes a bit like a combination of banana, pineapple and strawberry. 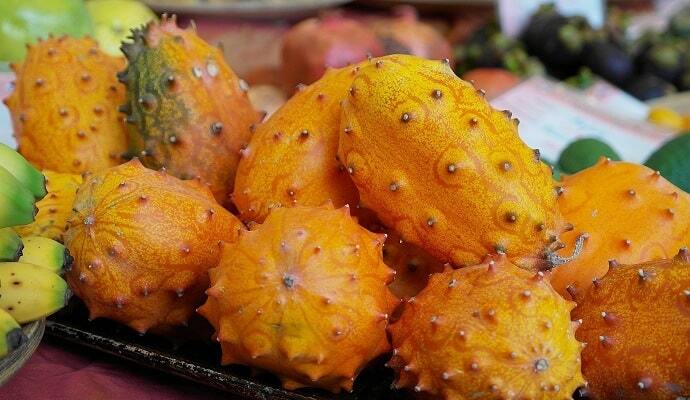 You’ll often find this weird but delicious fruit at Latin American style markets. The durian fruit is by many known as the smelly fruit. While it may be true that the scent of a durian’s flesh doesn’t appeal to everyone, it is in fact a very healthy and nutritious treat that you should try at least once in your life. Block your nose if you have to! 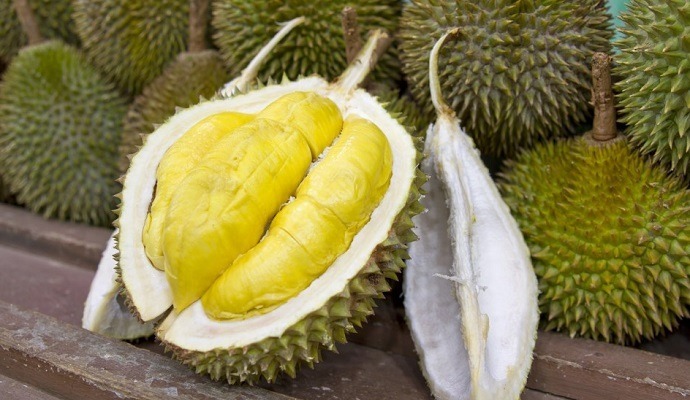 Native to Malaysia and Indonesia, a lot of people in Southeast Asia consider durian to be the king of fruits. Don’t be surprised when people run away when you cut through its spiky skin. Ouch! 🙂 But please don’t let that put you off, it’s a delicious fruit. The best place to find durian fruit is at Asian grocery stores. Native to West Africa, the miracle fruit may be small but it is gifted with the power to make sour fruits taste sweet, like magic. Mix the juice of this berry of that with lemons or limes and you’ll get a delicious drink. Because of this chemical, miracle fruit has been tried as a healthy alternative to artificial sweeteners. It’s also gained some popularity among dieters and patients with diabetes. The spiky and bright yellow/orange skin of kiwano fruit, also known as horned melon, will immediately grab your attention once you see it. And when you cut one open, the soft, green flesh may surprise you even more. Native to southern and central Africa, the kiwano fruit is a rare combination of a cucumber and a melon. It tastes like a mix of banana, cucumber, zucchini and kiwifruit. They can be a bit pricey in the US, but it’s definitely worth a try. Some say it has a somewhat boring taste, but I personally love it. 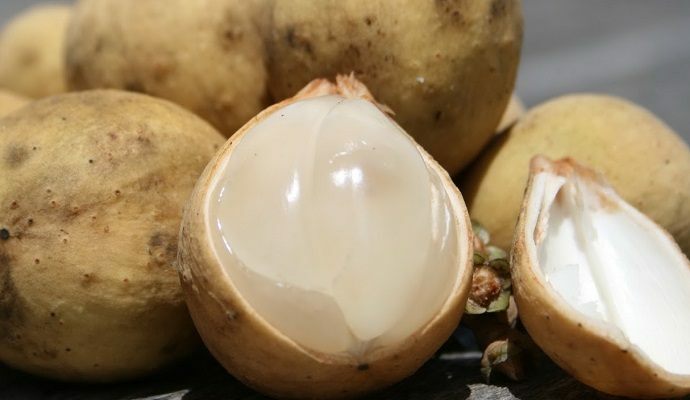 It’s good for you too, as it’s very low in calories and rich in a variety of vitamins and minerals, such as magnesium, potassium and vitamins A and C.
The mangosteen tree is an evergreen tree believed to have originated in the Moluccas (Indonesia) and the Sunda Islands. 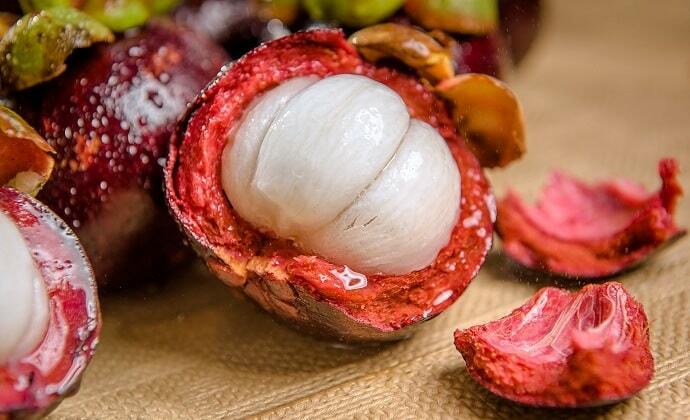 The fruits from the mangosteen tree are dark-red or purple, with white flesh that is deliciously sweet and juicy. The mangosteen fruit is a real treat, high in fiber and low in calories. While the tasty and nutritious mangosteen fruit has gained popularity in recent years, it’s a treat that’s still very hard to find. With the looks of miniature, oval shaped oranges, kumquats (or cumquat) is a delicious winter citrus fruit. Kumquats are very similar to oranges in nutritional profile and the way they look, but much smaller. The evergreen kumquat tree (it’s actually more of a plant) is native to China and South Asia but has also been introduced to Europe and North America. 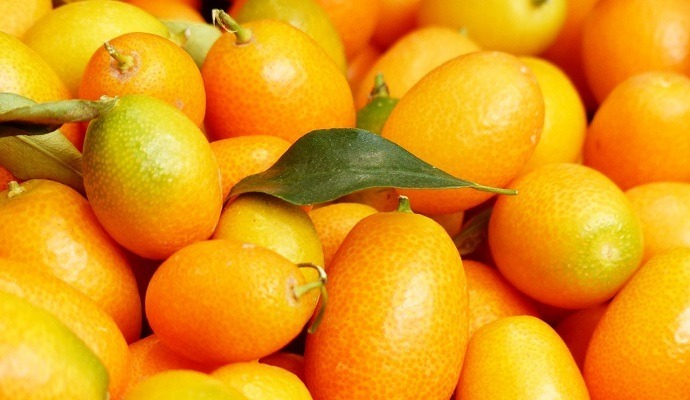 The kumquat fruit is rich in dietary fiber and loaded with a great variety of minerals and vitamins, such as vitamin C (unsurprisingly), magnesium, calcium and potassium. 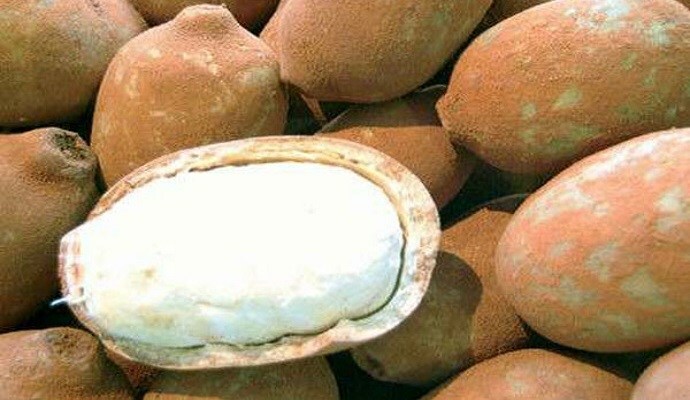 Brazilians like to think of Cupuaçu as an alternative to cocoa and chocolate. Cupuaçu (pronounced “coo-poo-asoo”) stems from the Sterculiaceae plant family of which cacao and chocolate are the most famous products. The pulp of the Cupuaçu fruit is tasty and smells a bit like banana. It’s a very potent fruit, loaded with B-vitamins, antioxidants such as flavonoids and fatty and amino acids. 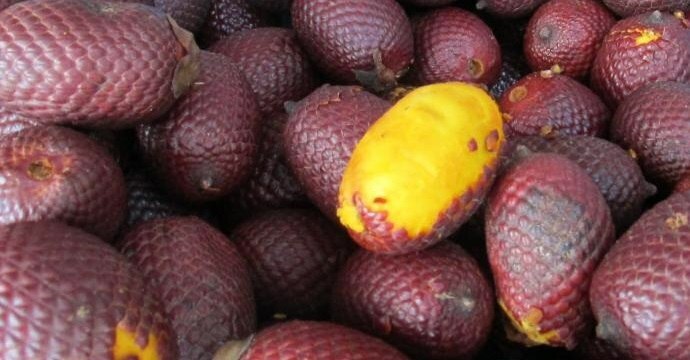 Cupuacu is quite a unique exotic fruit that you won’t easily find in the United States, but you may be able to find it in the form of shampoo, lotion, powder, butter or juice if you look hard enough. Rambut is Malay for “hair”, and looking at the fruit, this makes perfect sense. Rambutan is native to tropical Southeast Asia (in particular the Malay-Indonesian region), and is very closely related to the lychee. Rambutan is a delicious treat loaded with vitamin C and antioxidants. While it’s quite easy to find in some Asian countries, you would need a bit of luck to stumble upon this fruit at your local Asian grocer in the U.S. or Europe. Feijoa is also known as pineapple guava or guavasteen, and is native to South America but also commercially grown in California and New Zealand. The flesh of feijoa fruit is cream-colored with a jelly-like substance in the center. A great source of vitamin C and dietary fiber, feijoas are getting more popular and regularly pop up in bigger supermarkets and in specialty markets. Likely the most unusually shaped fruit in this list, the Buddha’s hand is actually a citrus fruit, but without the pulp. 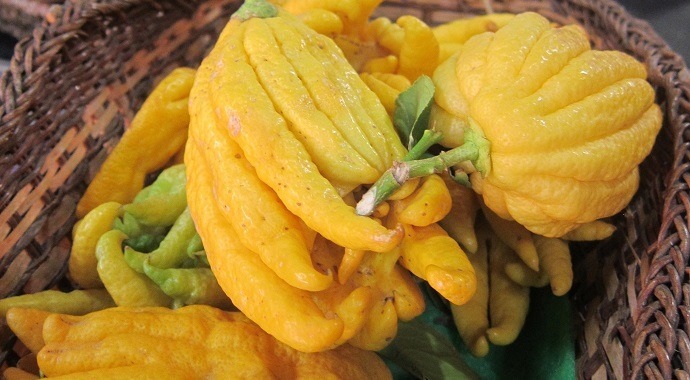 Originating from India and China, the weird looking Buddha’s hand doesn’t taste as bitter, and is mostly used for zesting and flavoring purposes. 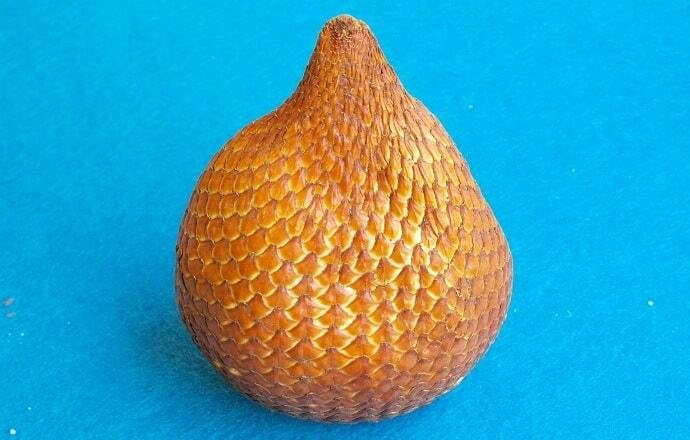 It’s obvious where snake fruit – also known as Salak – got its name from. But don’t let the looks of this Southeast Asian fruit scare you, because its deliciously sweet and sour flesh is to die for. 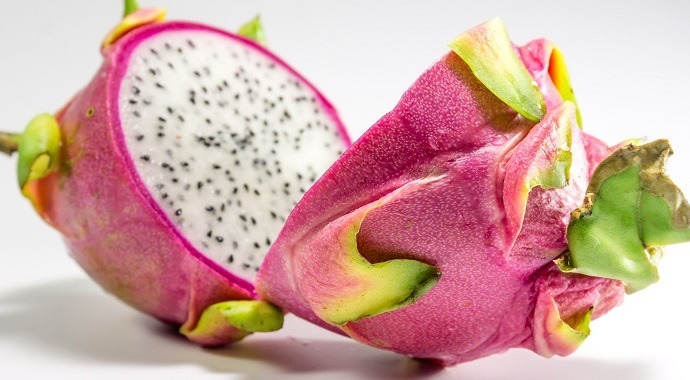 Perhaps not as rare or as unique as most other treats in this list of exotic fruits, the dragon fruit is still my personal favorite. Also known as pitaya, dragon fruit is native to South America, Central America and Mexico, and is also grown in Asian regions. Dragon fruit is about the size of a large potato and is usually red (magenta) in color, although they can also be pink and yellow. With 90 cm (35 inch) in length and 50 cm (20 inch) in diameter, the fruit of the jackfruit tree (also known as jack tree) is the largest tree-borne fruit. It may look similar to durian but they are in fact from different families, and luckily, jackfruit doesn’t smell as bad as durian does. 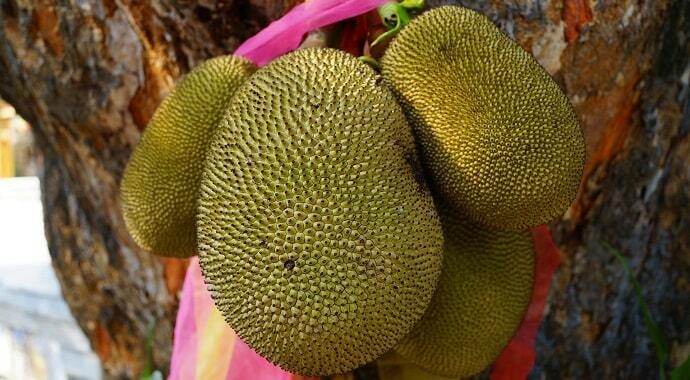 Named the national fruit of Bangladesh, a Jackfruit tree can produce up to 200 fruits in a year. Considering the size of the fruit, that is a lot of food! 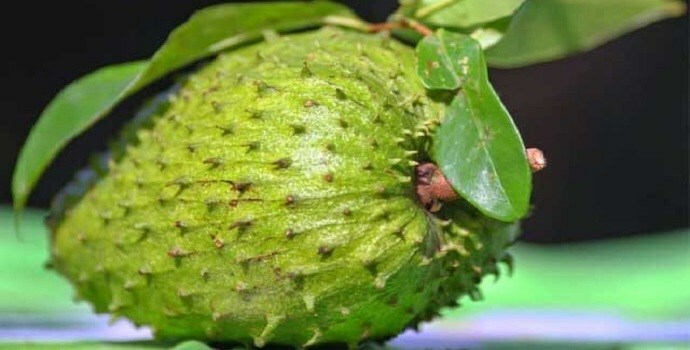 Soursop, also known as graviola, or custard apple, is a large, green tropical fruit with flesh that tastes sweet and sour. 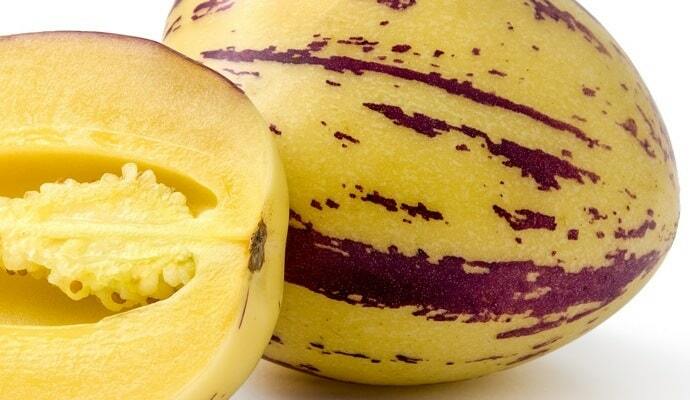 The pepino (solanum muricatum) is best described as a weird mix between a pear and a melon. Common in South America, the pepino is related to nightshades such as eggplants and tomatoes. 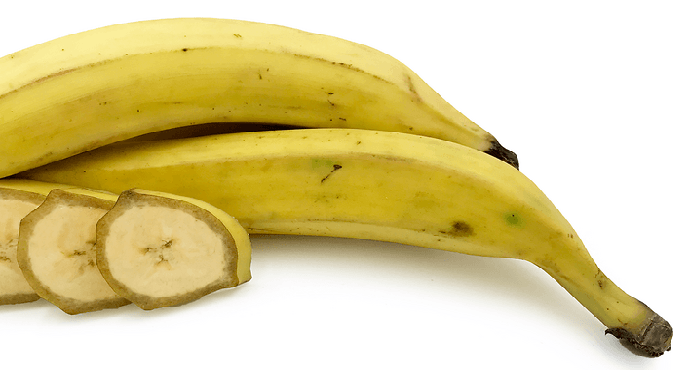 The plantain (or cooking banana) looks almost exactly like a banana, but it is a different fruit. While it’s part of the banana family, the plantain is low in sugar and should not be eaten raw. Popular in West Africa, Central America and The Caribbean, the plantain is usually fried, boiled or turned into a soup. Native to Southern Asia, the longan is a tropical tree related to the lychee fruit tree. 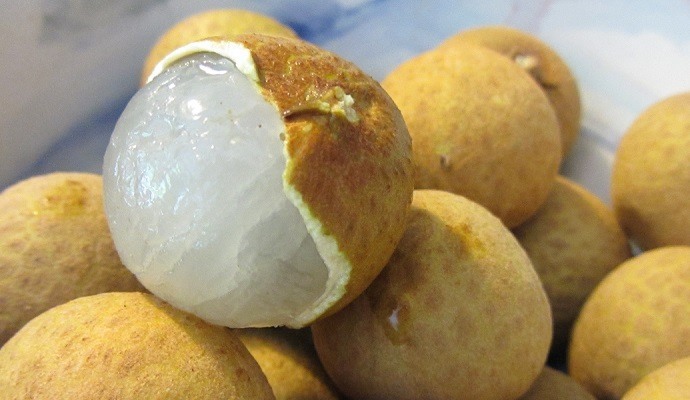 The longan fruit is an exotic little treat, often referred to as dragon’s eye. Longans have long been popular in China, not just because of their mild and fresh flavors, but also due to their claimed health benefits. Longan means “dragon eye” in Cantonese, and so named because the fruit resembles an eyeball with the black seed inside being the pupil. Often sold as dried fruits, longan is a rich source of vitamin C, vitamin B2 and potassium, but it’s also high in calories. Unfortunately though, outside Asia, longan fruits can be really hard to find. The unique flavors of these rare and sometimes weird and unusual looking fruits can be quite addictive! Lots of good fruit that I’ve tried but some of the Latin ones are new to me like the Pepino, Cupuacu and Cucamelon. I would love to try those. Wonderful! I will collect some pictures of exotic fruits eaten in Zambia. Have you ever heard of the “Rowenia” fruit tree? Someone gave me a small tree in a pot and I have it planted. Please email back if you know anything about this tree or where I can buy more of them to plant. Sorry Maurine, never heard of that one, but maybe someone else will chime in. Totally cool! I love tropical fruits and am on the hunt to discover more. This was a great resource!! Thanks Katy, glad you like exotic fruits as much as I do!